How can cattle improve the environment? In a program implemented north of Fort Collins in a ‘short grass prairie” receiving an average of 10-12 inches of annual precipitation; we implemented a grazing program designed explicitly to greatly increase water capture and retention. This requires a designed rotational grazing program to allow use, foster tillering and plant recruitment and management for growth and regrowth to full recovery in every pasture every year. In doing this we were able to increase forage on offer, leave greater residual cover and increase the diversity of the stand including greatly increasing the forb component. What we found is that the “short grass prairie” was really a mixed grass prairie suppressed by years of inappropriate grazing. We soon had major increases in cool season grasses and forbs and many tall warm season grasses that were not evident and not even thought to be a part of this ecosystem when we started. After five years in this program we had two dry streambeds that became streams that flowed 365 days a year and began to grow riparian vegetation the full length of their corridor. A critical part of this management strategy is to regain and manage cover on the primary terraces bordering the streambed. These are water storage areas and must have structure and cover to maintain the integrity to the stored water in the system. I can’t say that this works everywhere but I have enough experience in a variety of environments to know that one can vastly improve water capture and in doing so has a great probability of good things happening. Can Livestock Save the Planet? The world has a water problem. More and more of the landscape in temperate zones is turning into desert. The planet is warming due to greenhouse gases. Now along comes Allan Savory, the founder of holistic grazing management, claiming that herds of livestock can reverse these trends. It sounds a little too good to be true, but Savory makes a convincing case. My wife and I heard Allan Savory speak at the Quivira Coalition conference last October. Now everyone can hear him speak at the TED Talks website. It’s way worth twenty minutes of your time. And his photos of transformed landscapes are stunning. http://www.davidmjessup.com/images/Signature-David-J-just-one-for-inserting-1-300x119.jpg 0 0 David Jessup http://www.davidmjessup.com/images/Signature-David-J-just-one-for-inserting-1-300x119.jpg David Jessup2013-03-10 07:38:282013-03-10 07:38:28Can Livestock Save the Planet? Carbon Ranching—Don’t Treat Soil Like Dirt! First I thought we were cattle ranchers. Then I learned we were grass ranchers (the cattle are merely a way to get the grass to the bank). Then at a 2010 Quivira Coalition conference, I found out we are really carbon ranchers, of all things. Plants scrub the air of Carbon Dioxide during photosynthesis. Some of the carbon goes into the soil through the roots, where it gets stored in humus. Humus lasts a long time. It enriches the soil while removing excess CO2. Unfortunately, our chemical-heavy agricultural system is destroying it at a scary rate. “Don’t treat soil like dirt,” one speaker said. Following the conference, Linda and I paid a visit to John Wick, a California rancher working with the Marin Carbon Project. He’s all hepped up about the potential of wrangling carbon dioxide out of the atmosphere and storing it in soil humus. How? By spreading a thin layer of compost on his cattle pastures. He claims that a mere 2 percent increase in the carbon content of agricultural soils in his state could absorb all the annual CO2 emissions from California vehicle traffic. Oh, and by the way, the increased soil carbon makes the grass grow taller and faster. So you can improve your pastures and help save the planet at the same time? Sounds like a bargain. We’re now trying to replicate some of his research here at Sylvan Dale Ranch. With some advice from John and carbon researcher Whendee Silver, a UC Berkeley professor, and some baseline soil samples taken by Rich Conant at Colorado State University, we spread compost on one side of our pasture in a checkerboard pattern to create a number of sample plots. CSU’s Center for Collaborative Conservation helped pay for some of the compost (it’s expensive!). We’ll mob-graze some of these plots with our cattle herd to see if trampling hooves and manure also enhance carbon storage. Then more soil samples. Results will be posted here as they come in (not soon, I might add – soil building is a long-term process). The Carbon Pilgrim. Courtney White, founder of the Quivira Coalition, writes eloquently about carbon ranching and explains the carbon cycle in a way that inspires the same goose-pimply feeling you get when contemplating the universe. White chronicles his trip to find out whether farming and ranching could play a significant role in reducing CO2 using carbon sequestration. A book is in the works. The Soil Solution, a five-minute film on Youtube. Sustainable World Media visits with farmers, scientists, and educators who are exploring the connection of soil fertility to water quality, food security, and carbon sequestration. Enjoy. This is good stuff. http://www.davidmjessup.com/images/Signature-David-J-just-one-for-inserting-1-300x119.jpg 0 0 David Jessup http://www.davidmjessup.com/images/Signature-David-J-just-one-for-inserting-1-300x119.jpg David Jessup2012-05-28 07:19:132012-05-28 07:19:13Carbon Ranching—Don’t Treat Soil Like Dirt! Can ranches and farms in the Poudre-Big Thompson watershed improve the quality of water used by Front Range urban dwellers? That question is being addressed by a pilot project at Sylvan Dale Ranch, a 3,200-acre working guest ranch located at the mouth of the Big Thompson Canyon west of Loveland, Colorado. Owned and operated by the Jessup family since 1946, Sylvan Dale hosts family dude ranch vacations in the summer and everything from weddings to corporate events during the rest of the year. The ranch also runs a cow-calf operation that raises 60 calves per year to grow and sell as grass-fed and grass-finished natural beef directly to local consumers. The Jessups have been concerned about runoff from manure in their cattle pens and horse pastures next to the river. Although small in amount compared to feedlot operations, the nutrient runoff reduces water quality in the river and may even contribute to recent duckweed blooms in the ranch’s trout ponds below the pastures. 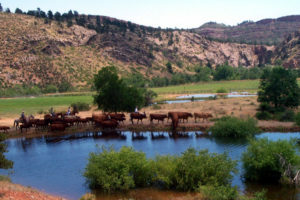 In 2010 the ranch invited the Natural Resources Conservation Service (NRCS) to analyze the problem and suggest solutions. Three options were suggested, all of which required considerable cash outlays. As with many close-to-the-margin family ranches, such expenditures sometimes fall to the bottom of the list as equipment repairs, leaky roofs, broken water pumps and other urgent projects rise to the top. Several organizations came forward to help. CSU’s Institute for Livestock and the Environment (ILE) provided an implementation grant with a community outreach component to share lessons learned with a larger public. A group in formation at CSU’s Center for Collaborative Conservation, preliminarily called the Colorado Conservation Exchange (CCEx), saw an opportunity to demonstrate how a marketplace might be created for community members to support land stewards who seek to conserve and enhance natural resources. The Big Thompson Watershed Forum (BTWF) provided technical expertise to measure nutrient runoff before and after any changes are made. Northern Water (NW) agreed to provide a Parshall flume and rain gauge for these measurements, and the City of Loveland Water Department agreed to do lab tests. All sought an answer to this question: How many pounds of nitrogen, phosphorus and organic matter can be kept out of the river by implementing a solution, and what is the most cost-effective way of doing so? All were interested creating a pilot project to serve as a model for other water quality efforts. By itself, the Sylvan Dale effort will have a negligible effect on overall nutrient loads in the Big Thompson River. But there are hundreds of small livestock and horse properties in the watershed that collectively have a considerable impact. Large-scale animal feeding operations are required by law to mitigate their runoff and environmental effects. Similar rules for small family operations would likely put them out of business. The CCEx hopes to implement a voluntary marketplace whereby communities, organizations, and individuals who benefit from cleaner water will provide resources for land stewards who seek to provide it. If this is done on a wide scale, the improvement in water quality could be significant. All would benefit: water users, city dwellers and family farms and ranches.